Readers of this website will know that I have a special interest in Central Asian monumental art, particularly mosaic architectural panels on private and public buildings. Imagine then my delight in coming across a map of Bishkek's mosaics produced by STAB - School of Theory and Activism Bishkek. This map is the result of a two-year research project which included the attribution and interpretation of the city's Soviet monumental art. The map includes virtually every major mosaic in Bishkek, located both in the city centre and in suburban areas. 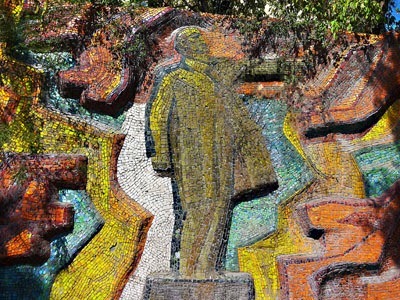 Of the seventeen mosaics, six are combined into a walking route. The map, in English and Russian, is accompanied by details about the mosaics and cultural commentaries - a perfect tool for exploring independently. 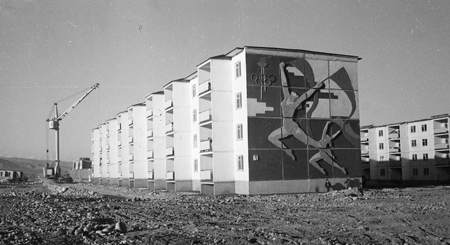 STAB wants to draw the attention of Bishkek residents and visitors to the artistic heritage of the socialist modernization project of the 1960s -1980s. As well as offering urban exploration, this project helps preserve these mosaics in Bishkek, since many of them, despite having state protection status, are in poor condition. 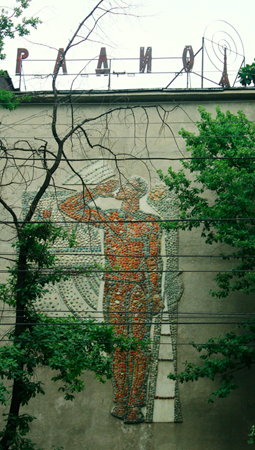 (By the way, the last monumental panels were created in post-Soviet times. In 2004 Alexey Kamensky, a professor at the Academy of Fine Arts, decorated two panels of the academy. Students were involved in firing ceramics in the academy's workshops and installing them on the building). STAB also runs regular walking tours of the mosaics, in English. You can contact the group via its English website. You can buy the map (about $3) directly from STAB's office. Just call in advance to check opening hours. 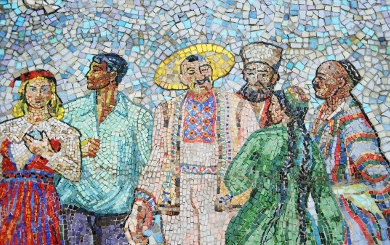 Here are some examples of Bishkek's mosaics. Instead of traditional monumental forms, the imagery has given way to a "painting-like haze". 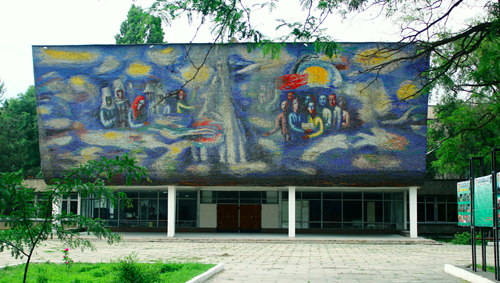 It decorates a campus building of the Kyrgyz National University. Many mosaic panels were incorporated into residential buildings in quiet neighbourhoods. Several were created by construction workers themselves, such as the example above, not by members of the official Union of Artists. Sport was a prominent theme and this image of female athletes, which matched one of male athletes, was created to inspire residents to develop healthy athleticism. The panel above, "Radio and Nowadays" is connected to the building's function as a radio centre: radio waves emanate from the figure of a giant who has tamed visible and invisible substances. Science was one of the favourite subjects of monumental art - graphs, charts and scientific instruments were excellent representations of the triumph of rational knowledge. This mosaic is made of stone - in the 1960s pebbles and other materials were significantly cheaper than ceramics and glass. (Cobalt glass was imported from Ukraine during the Soviet period). The detail at left is from the first mosaic that was created in Kyrgyzstan, in 1964, to celebrate the 100th anniversary of the accession of Kyrgyzstan to Russia. It is done in the spirit of colourful, socialist realism. Update December 2014: The Soros Foundation has published a 2015 calendar using images of Bishkek's mosaics. It is available at the STAB office, Bishkek, as are postcard sets of the mosaics. View the images. (The pdf file may be slow to load, but it is worth the wait).